The 50 year old charity Find Your Feet that supports poverty stricken families in India, Malawi, Nepal and Zimbabwe recently launched a campaign called Curry for Change to raise awareness of their work with poor, rural families in India and raise vital funds to change lives by celebrating Indian Cuisine. Ananya’s Founder and Managing Director, Vaishali Shah, who has been a keen and active supporter of Find Your Feet for several years, was responsible for designing the logo and creating the branding and marketing material for Curry for Change. 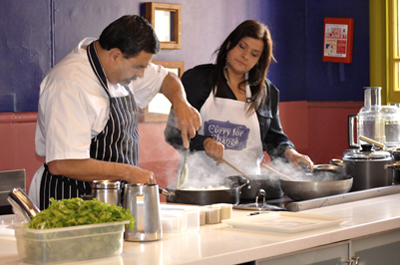 Acclaimed chef Cyrus Todiwala and his restaurant Cafe Spice Namaste (regularly featured on Saturday Kitchen and Daybreak) held a master class where Nina Wadia (TV soap star) joined the chef in the kitchen at Cafe Spice Namaste on Wednesday 13th June in front of an audience of food fans. Aprons worn at the master class by Cyrus Todiwala and Nina Wadia bore the Curry for Change logo designed by Ananya, as did the goody bags which contained pretty bookmarks donated by Ananya. We are delighted that Nina Wadia signed one of our new range of greeting cards. 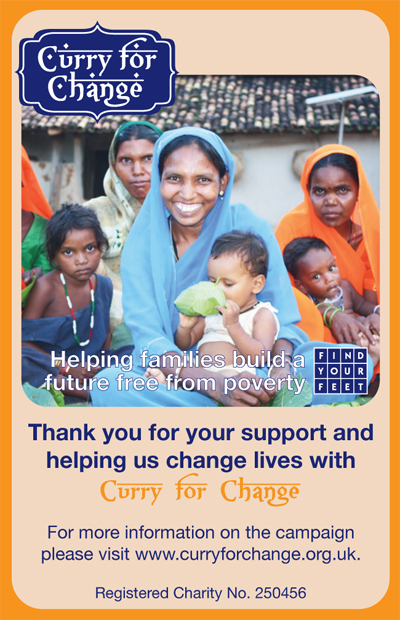 The Curry for Change logo and branding has been used by Find Your Feet in their micro website and promotional material at participating Indian restaurants has also been designed by Ananya.